Several physics engines currently provide software for soft-body simulation and Marvelous Designer is one of them. The realistic interaction of simulated soft objects, such as cloth, with their environment, is vital in order to obtain visually realistic believable cloth simulation results. (Cloth self-intersection is important in some applications for acceptably realistic simulated garments). This is quite a challenge at interactive frame rates, particularly when detecting and resolving self-collisions and mutual collisions between two or more deformable objects, like 2 clothing items or cloth and Avatar. Cloth is a deformable object. Software for cloth simulation use complex algorithms. Maya nCloth offers detailed control of cloth and material simulations. It enables you to convert polygon mesh models into nCloth objects, to paint cloth attributes such as bend, stretch, shear, and dent and to make 3D objects stiff, viscous, or flowing. You can also attach buttons, tear cloth, and control movement with topology-independent constraints. It is possible to simulate cloth-on-cloth, such as a shirt over pants and achieve highly realistic results without self-interpenetration errors, and blend multiple cached simulations to achieve complex effects. nCloth is a very fast dynamic cloth simulation engine using a proprietary simulation engine called Nucleus to simulate a wide range of polygon surfaces – only works with polygon meshes. Here’s an example cloth simulation tutorial video on how to transfer geometry cached animation back and forth between Marvelous Designer and Maya. Note, you can connect geometry caches with the trax editor. Havok Cloth – Havok is a popular and reliable performance-optimized development tool for creating believable cloth, hair, foliage and other soft body objects simulations. Havok Cloth is fully multi-threaded and cross-platform optimized for leading game platforms and the Havok Physics claim to offer the fastest, most robust collision detection and physical simulation technology available. Havok Cloth is widely used to simulate dynamic clothing by the game industry and by leading video game developers in hundreds of launched game titles. SyFlex Cloth Simulator is claimed to be the cloth simulation engine behind many of the hyper-realistic cloth animations seen in today’s 3D productions, special effects in feature films and also in commercials using 3D VFX and CFX. SyFlex makers claim they have an incredibly fast and stable soft body simulation engine, along with a wide collection of tools (provided with the plugin) for the creation of a wide range of effects. 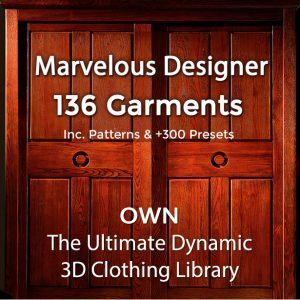 Master Marvelous Designer to create your dynamic 3D clothes fast and easy! Own The Library of 3D clothing patterns and Marvelous Designer fabric presets. 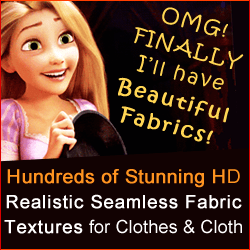 Beautify your 3D clothes with our hyper-realistic seamless fabric textures. Qualoth cloth is another cloth physics engine which offers a sophisticated physical model and numerical algorithms which produce realistic wrinkles and fabric animation when you need a reliable and fast dynamic 3D cloth simulation engine. It’s a fully multi-threaded solver with unmatched computational speed – according to the company making it. Qualoth has been proven in rigorous production environments in some of the biggest 3D animation studios in the world. They boast reliable collision handling and a rich set of controls plus a Seamless Import from 3D Garment Design Tools like Marvelous Designer. Qualoth will accept quad-mesh, tri-mesh, and even non-manifold mesh as input geometry, for greater realism with a wider variety of source models. Qualoth also allows you to create clothing not only from cloth mesh draped on an existing 3D human model, but also by working from traditional patterns. This lets you produce realistic garments from imported CAD patterns in dxf or eps file format, such as those produced using CAD production software such as DC Suite, Marvelous Designer, Optitex, Yuka CAD or Adobe Illustrator.